18 Karat Yellow Gold Bangles: Get On It! If you are looking for some new jewelry then you should check out this upcoming live auction for a set of 18 Karat Yellow Gold Bangles. 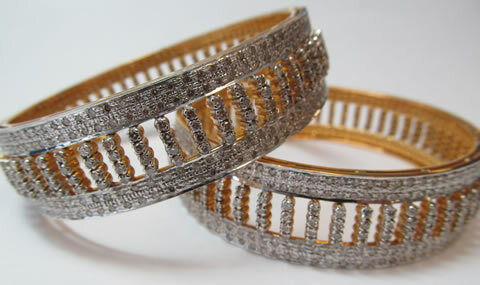 These bangles are located in the state of California and can be yours extremely soon! These bangles would make nice gifts for anyone who likes to wear fancy jewelry and would be a nice token of affection for that special someone. They look like they are in great shape and would really pop with certain outfits and you could probably wear them every day for that added shine of excellence. These bangles won’t be around forever and with this auction you could probably save a buck or two if you really try hard enough. This set of bangles would make you look dynamite. Find out more about this lot and about more items by checking out your free trial now. If you want to get married and are looking for that perfect ring then you should check out this upcoming online auction for a Diamond Platinum Engagement Ring. This ring looks like it is great shape and can be yours very soon. Diamonds are a girls best friend but when you combine them with platinum and the intention to marry then you know you have just given your lady a BFF for life. They still use that phrase right? This ring is located in Florida and can be picked up or shipped out when you win. This ring would be a game changer if you ever did decide to get it for your significant other. It is pretty hard to find a nice engagement ring and this one is pretty durn sweet if you asked us. Find out more about this item and about many more government auction items by activating your free trial account immediately! Diamond Sapphire Ring: Looking Good! 14 K Diamond Ring: For That Someone Special!